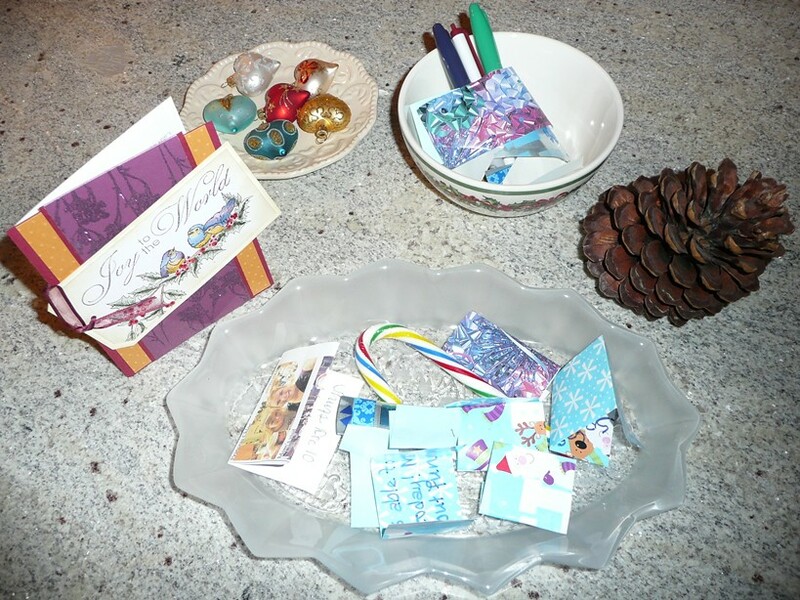 It is almost time to read the contents of the Goodie Jar. Oh yes, the Goodie Jar. We are still doing it. We actually have three containers going on. One was the original one that is the Princess House Pitcher. That one looked pretty festive (and it was full) so I put it in the China cabinet hoping it could be passed off as a Christmas decoration. Then the other one is a container that sits on the peninsula and has to be put away to make room for the Christmas decorations that are all over the peninsula. So I have a note in the present Goodie Jar dish that reminds me to go into the closet to get the planter that we were using to put good things in. So it is almost time. I really like this tradition. I think this is the third year that we have done it. I am not sure, but I think we will do it again next year. I have not read any of the notes in the containers, but I am pretty confident that there will be a few about our cats. They are such good girls and the certainly make me smile when I think about them. So I am sure both of us have documented that! There are always moments that I write down about my students making me smile. The latest one is my socks. LOOK! Aren’t they cool. 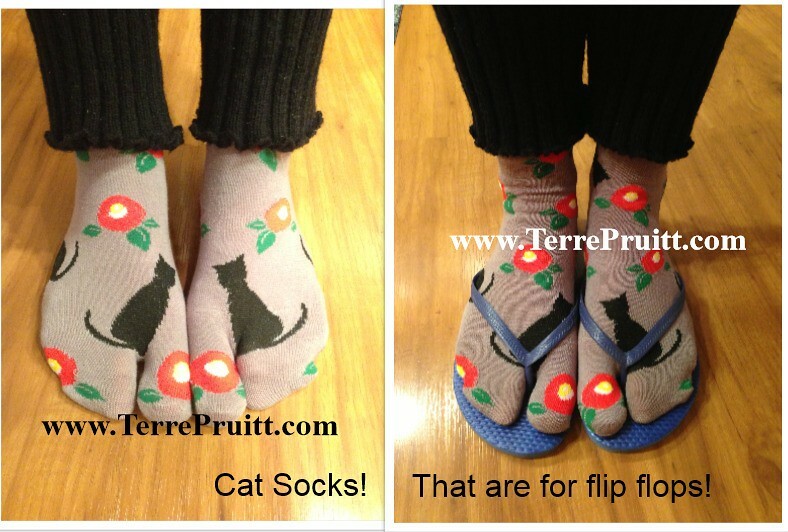 They have cats on them AND they can be worn with my flip flops. I was explaining to my students one day that since I have to rush over to class I didn’t want to put on my socks and shoes and my feet were really cold. Ya see, in the morning on the way to my first class I wear socks and shoes. But there is not a lot of time for me to get to my Tuesday morning yoga class after Nia so sometimes I just put on my flip flops after class and my feet get cold. So one of them picked up on that. Super sweet. The socks are super cute. They have cats!!! She is a cat lover herself! Lately we have gotten some rain. And by lately I mean this week. Rain — for me — always goes in the Good Things Jar because it is really a good thing. There is just always something that is a good thing that makes me smile. So many of my friends, family, and students are noted in that jar. If you have not done a good things jar, I would like to strongly suggested it. It is such a great way to remember the good things in life. And it is really fun because you get to get TWO, maybe even THREE, smiles out of them. One is when the thing occurs, two is when you write it down, and three is when you read it. And sometimes it is really funny when you read it because it might take you a minute to remember what you were talking about. Then, if your family and friends (or whomever you are reading them with) are into it, you get to tell them the story. Often times things that make you smile make for a good story. Ooooo! I am getting really excited thinking about it. Can’t wait!!! So are you still doing a good jar? Might you do one next year?